The continual emergence of bacterial resistance problems to current clinical drugs has brought a severe threat against human being’s health; and the development of novel antimicrobial agents for selectively inhibiting the constantly evolved bacterial targets has also been continually promoted, with challenging processes like marathon race. FabH, which initiated the fatty acid biosynthesis cycle, provided considerable new opportunities in novel antibacterial drug discovery. 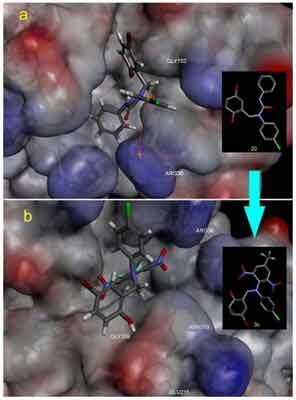 Based on our previous findings that o-hydroxybenzylamine derivatives demonstrated potent FabH inhibitory and antimicrobial activities, computer-assistant drug design was introduced and then a series of novel nitrobenzotrifluoride-containing ohydroxybenzylamine derivatives (3a-3x) was designed and synthesized. Most of them were more potent than the corresponding urea analogues, with compound 3d being the most potent member. Furthermore, the structure-activity relationship of all synthesized o-hydroxybenzylamine derivatives as FabH inhibitors was studied, and inhibitory potency of top antimicrobial compounds against the aminoacylation of S. aureus tyrosyl-tRNA synthetase was also evaluated. Antibacterial agent, computer assistant drug design, FabH, nitrobenzotrifluoride, o-hydroxybenzylamine, tyrosyltRNA synthetase. School of Medical Engineering, Hefei University of Technology, Hefei 230009, P.R. China.